Recently enjoying major construction work, San Antonio International Airport (SAT) is trying hard to improve its road system, parking garages and overall flying experience. The meet ever-increasing growth demands, San Antonio is building two new terminal buildings, which will take the overall gate capacity to 35. A new five-level parking garage is also scheduled to be completed soon. Sited just 8 miles / 13 km north of central San Antonio and next to the North Loop, Hill Country Village and the Blossom Athletic Centre, San Antonio Airport features around 20 different airlines, offering non-stop flights to more than 40 destinations, most of which are based in the USA. Annual passengers are now approaching nine million, with the airport averaging over 270 daily flights. Ground transport at San Antonio Airport links the city centre and all of the main radiating districts. These include the affluent Alamo Heights neighborhood, the renovated King William district, the historical Monte Vista, and Northwest San Antonio, where many strip malls and office blocks reside. Shared-ride shuttles are especially popular, linking the airport with many hotels in downtown San Antonio, while Via Metropolitan Transit buses are also available, along with charter bus services and taxis, linking destinations such as Fiesta Texas, the North Star Mall and Retama Park. Further information about onsite transportation can be obtained from the various curbside booths outside of the terminals. One of the biggest cities in the whole of America, San Antonio is sited in the state of Texas and contains plenty of interest. 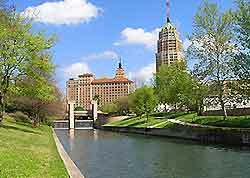 Downtown San Antonio is extremely walkable and the scenic Riverwalk has also become a great place for a stroll, within easy reach of the city's busy airport. The main city attractions include the regular killer whale shows at the SeaWorld San Antonio, the ghostly goings-on at Ripley's Haunted Adventure, the many white-knuckle rides at the Six Flags Fiesta Texas, the historic Alamo building, and the Tower of the Americas, which dominates the city and boasts a popular observation area and revolving restaurant. For shopping, head to the El Mercado de San Antonio (Market Square), where many local handicrafts and souvenirs are for sale. San Antonio Airport (SAT) enjoys a fairly central location in Texas and is well placed for those looking to explore the region. Nearby, the Hill Country and Austin both lie to the north-east, while further afield and to the east, the city of Houston can be reach along the I-10 interstate.